Gastown—(January 10, 2019) After the new year, we are now fully ready and in the mode of the sixteenth annual Dine Out Vancouver Festival with its many set menu options. 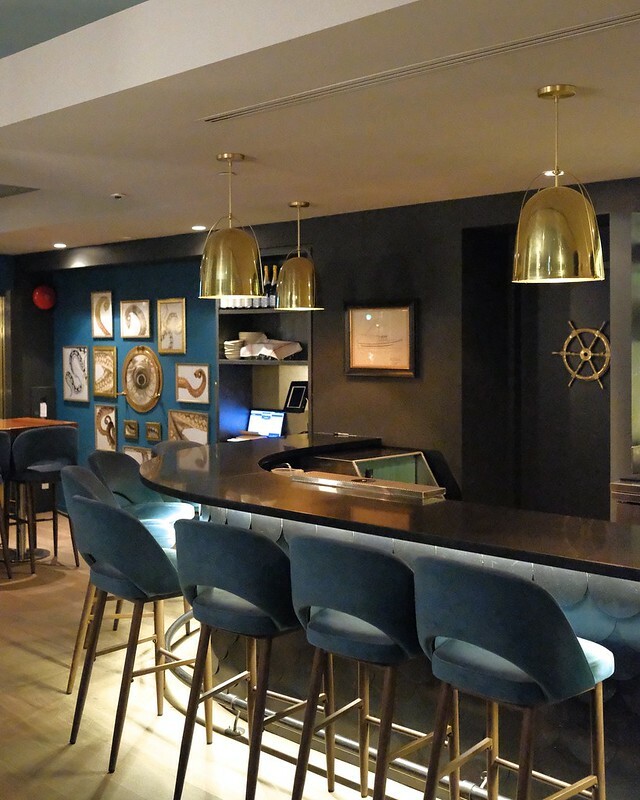 Last week, on the first-stop of our Tourism Vancouver restaurant tour, we were treated to the still newish downtown shellfish eatery Coquille Fine Seafood to sample their various three-course prix fixe dinner ($45) items. 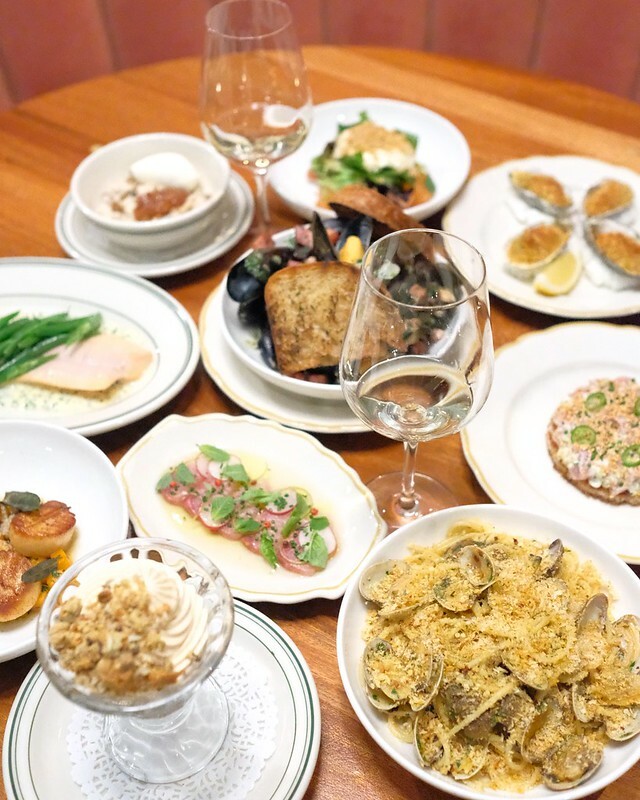 The spacious, modern yet classically decorated 4,100 square foot fish house from team L'Abattoir offered a pleasant creative vibe to its quintessential seafood and shellfish dishes. With seating for a hundred in an expansive dining room, bar, and lounge appointed complemented by a nautically-inspired décor, I was excited to revisit the restaurant after its initial opening and buzz. 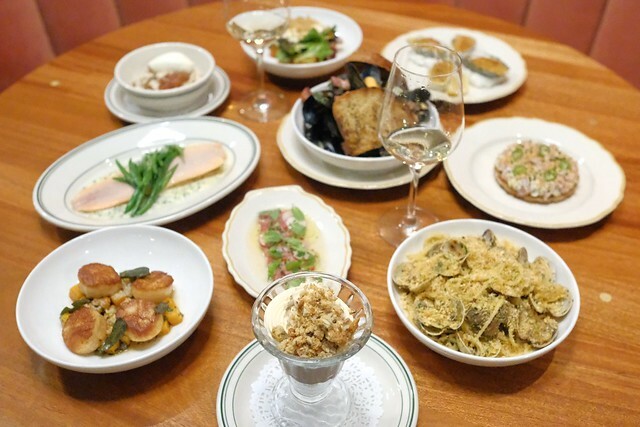 Luckily, Coquille's Dine Out menu is made up mostly from existing dishes from their regular menu with a few exceptions—modified for the set menu—but thought to be up to 80% of what they normally offer on a nightly basis. To start, both the yellowfin tuna tartare (with crispy rice, sesame dressing, green onion, and cucumber) and Coquille ceviche (white fish, shrimp, octopus, citrus, red onion, and chips) were dynamite fishy appetizers well-prepared and presented. The tartare, in particular, was quite refreshingly flavourful as a nice meal primer. I also really dug the how the grilled and broiled oysters (with garlic butter and breadcrumbs) were cooked and seasoned—quite delectable. Next, the entrées proved savoury and satisfying with more than a few very appetizing seafood dishes. The table's obvious highlight was the spaghetti and clams (with chilies, white wine, and parsley) for its tasty simplicity, seasoning, and easy comfort. Second, the gently slow-cooked fillet of trout (with sautéed green beans, beurre blanc, and fine herbs) was another subdued yet filling endeavour. Finally, the roast scallops (with squash gnocchi, browned butter, and capers) made for a safe yet solid effort. For dessert, I was most delighted by the classic soft serve sundae (with brownies and hot fudge or strawberries and jasmine shortbread) while the dark chocolate cremeaux (with salted caramel chantilly and biscotti) and baked rice pudding (with raisins, banana, and white chocolate) were also not-too-sweet classical treats fit for capping off any dining experience. 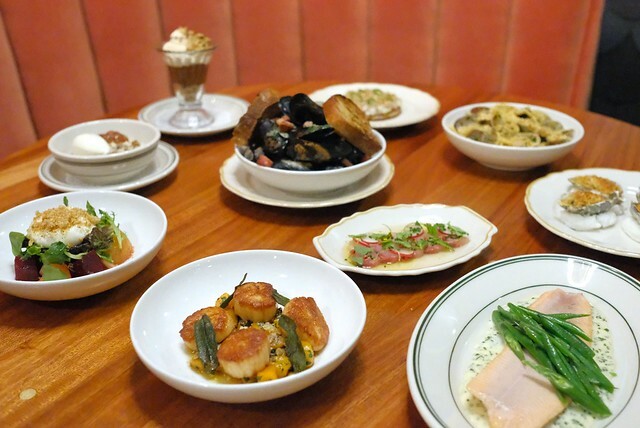 Overall, I was impressed with Coquille's many offerings as a good representation of their regular dinner menu with a few obvious limitations. 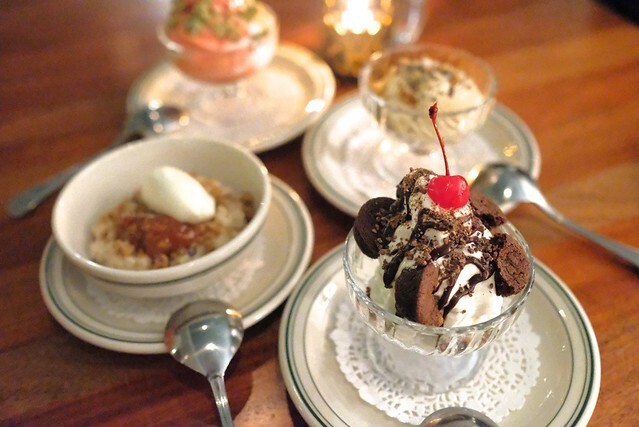 It proved a satisfying meal with pleasing dining options that was a culinary delight. Dine Out is on now and runs until February 3rd. It was nice meeting you in person! Don't forget the crocheting. That was a hoot. THIS IS RIGGED, JACK LAYTON OBV WINS BY A LANDSLIDE. Omg! Now I'm even MORE convinced that my NDP vote was the right one! There was only one bad photo of May I could find and it wasn't high res enough. I just saw Mud the other week - I went in with no expectations, and ended up leaving the theater so surprised by how much I liked it. Reminded me of Stand By Me. Agreed, it's such a well executed film. bigger shocks and faster delivery. A remarkable achievement in filmmaking that will have you on the edge of your seat. every trope in the indie-dramedy book. I blame the Duplass brothers. Hardy and Theron take their roles as seriously as they would for any Oscar-season awards contender. Surely this is a great place to dine out. I simply love it. Saw this movie last weekend. The wife and I really liked it. Definitely a very enjoyable movie. There wasn't really anything to complain about. A great cast, an interesting story. Good humour. Pick one thing and do it well.. the whole meal delivery/ produce market / eatery / organic produce delivery is confusing! For both staff and patrons alike and I bet it shows. Spud and the rest of these over zelus entrepreneurs are clearly greedy individuals who don't believe in the values they advertise. If ur all about bringing fresh amazing food to your peers than why so many hands in so many pots. Bleeding borrowed money and time? Grasping for straws? Just a matter of time till we pick up ur prices and take over and do it right.. small, with hard work and passion.love for what we do..not love for money which drives these individuals.. I think its important note that Callister is not actually a co-operative brewery. take a look https://en.wikipedia.org/wiki/Cooperative To my knowledge brewers lease space on a year to year basis, this is more of a collaborative set up as the brewery remains owned at least to my knowledge by the proprietors of Callister brewing. Noted. Thanks for the clarification. Hmm interesting, what does Canadian cuisine entail? Some of the food looks rather American but delicious nonetheless! I like the addition of a video at the end of your blog post! Good recap out of the evening!